Reading time – 2:05; Viewing time – 2:54 . . .
Well, really not all that dear. 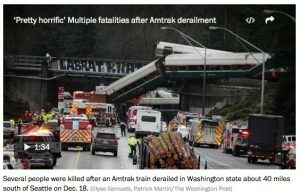 This week we had a train wreck in Washington, as an Amtrak train flew off the tracks near Tacoma. People have been injured and some have died; perhaps yet more will die. We’ve had another train wreck in Washington, as our Republican majority Congress (that means YOU, Republican senators and congresspeople) has managed to pass tax legislation that will further injure an enormous number of Americans and will allow many of us to die prematurely. In both cases you who are in charge seem to have forgotten that your job is to protect and serve the people and to do it with care. With the passage of the Republican-only, so-called tax reform act, once again you have managed to do exactly the opposite of what the American people want you to do. By an overwhelming majority we Americans disapprove of your hateful bill and wanted you to stomp it to death. You didn’t do that. Study after study have shown that we want sensible gun safety laws, universal healthcare, protection of our national parks and wilderness areas, clean air and water, excellent public education, an end to our endless wars, a solid battle against global warming and more; but you consistently deliver the opposite. This time you managed to put yet more billions of dollars into the pockets of already rich people, create an additional $5,000 of debt for every one of we 320 million Americans and you dumped the burden primarily on the backs of our poor and middle-class children. Congratulations on successfully sucking up to your rich donors, padding your own pockets and the pockets of the President and blowing off the rest of us. You Republicans passed this junk legislation without any input from Democrats, with no input from tax experts and with no hearings in Congress, listening only to yourselves and those rich interests that have their hands up your back. This is exactly why we don’t trust you. We want you to do things cooperatively and help to end our culture wars, not to make them worse. Exactly what is your problem with that? How you can be so dumbfoundingly deaf to the voices of the people? 81% of Americans disapprove of you (that’s you, personally) and the job you’re doing. Can you figure out why? C’mon now, Republican congresspeople – you’ve been in charge for 7 years and ought to know by now what we the people want. Yet we’ve known for a long time that you don’t want to hear from us, but we want to hear from you. Answer my questions. Reading time – 3:16; Viewing time – 4:51 . . .
Maureen Dowd gave her Sunday column to her conservative brother Kevin on November 26 and we learned that he isn’t tired of winning. I’m sure that’s true, as Trump hasn’t won anything, but Kevin Dowd’s remarks deserve comment, so this is a letter to him. You begin, Kevin, by telling us, “Every time I hear Neil Gorsuch’s name, I smile.” Hold that grin, Kevin, because you would never so much as know Gorsuch’s name were it not for Mitch McConnell’s bedrock dishonesty. We keep hearing that elections have consequences, and so they do. Barack Obama was elected President twice, which means that he had dibbies on who to send to the Supreme Court. Does your smile fade just a bit because you know that Merrick Garland, however you may dislike his views, rightly should be there? Is getting your way more important than following the rules? You admire Trump for his resilience against “an unrelenting and unfair press” – really? The press is supposed to be unrelenting – you remember: the Fourth Estate holding politicians’ feet to the fire – and it has been unrelenting with every President you can remember, so get over that. And tell me about the unfair reporting from the mainstream press. Not the wacko stuff from the publications telling us about the woman with three breasts and the guy who was abducted by aliens who probed his navel. You’ll easily find reports that condemn Trump for his malfeasance or a stupid tweet or his more than five lies per day, but none of that is unfair. C’mon, name just one unfair report. Until this week Kim’s rockets could only hit the west coast, so you wrote, “we’re probably alright until he can hit a red state.” Did you actually write that? Is that some kind of comfort for people in red states, willing to sacrifice the people of Washington, Oregon and California – any blue state – as long as it doesn’t nuke the red-staters? You claimed that Trump is undoing Obama’s executive orders, and so he is. The problem is that he’s doing it just to spite Obama and there is no strategy or even any logic that goes deeper than that. 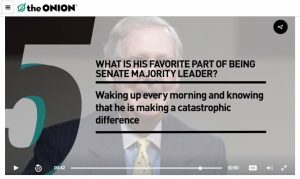 He’s getting his federal judge nominations through because McConnell blocked more of Obama’s nominations than any Senate leader in history. Thank you for your admission that, “The N.F.L. players were disrespecting the American Flag . . .” because you reveal your bias for refusing to see what is right in front of you. Thank you, too, for pointing out that while we haven’t seen a direct connection between Trump and Russia, Mueller’s investigation has found collusion with Hillary and the D.N.C. on the dossier. You also snarkily claim that she has several donors on Mueller’s staff, “ready to offer legal advice.” The public evidence continues to mount of nefarious Trump connections with Russia and your comment is about how crooked Hillary is? Classic switch and attack, but your comments have nothing to do with Trump’s likely illegal and treasonous activity. Nice job, too, of urging the prosecution of Loretta Lynch and James Comey. Got nuthin’ to do with crooked Donald, but it’s a fine distraction from what’s important. The real value of your essay, Kevin, is the way you have displayed the Trump supporter mindset – the deflections from core issues, the conscious enthusiasm to ignore outrageous wrongs, the blissful attitude that if it doesn’t hurt you directly it’s okay and your impenetrable blinders for harm to others. But here’s the thing, Kevin: there are others out here beyond your skin who are affected by his behavior and do have a problem with things like encouraging hatred, cancelling DACA, multiple vacuums where strategies should be, taunting a murderous nuclear dictator, trying to trash the only thing standing between us and a nuclear Iran, pulling out of the Paris Climate Accord as though we aren’t on our way to frying the planet, his trying to refuse healthcare to tens of millions of Americans, his letting the people of Puerto Rico suffer because Trump’s pals on Wall Street want money and his trying to pass a tax bill that primarily enriches wealthy people and does so on the backs of poor and working class Americans and leaves us with a $1.5 TRILLION debt. Ah, Kevin, it must be nice and comfy to ignore the harm this President is doing and just bask in the glow of the raised middle finger that is Trump nation. YOUR ACTION STEPS: Offer your comments below and pass this along to three people, encouraging them to subscribe and engage. Thanks! Reading time – 2:45; Viewing time – 3:58 . . .
Healthcare is our current favorite distraction from the Russian cyber invasion of America and the possible involvement of Trump groupies, so let’s have a look at what the geniuses in Congress have proposed for the health and well being of all Americans. It’s well established that the House and Senate attempts at delivering on the brainless “repeal and replace” mantra have little to do with healthcare delivery to Americans. Healthcare is simply the cover for an $800 billion dollar gift to already rich people. In the unlikely circumstance that you aren’t fully enraged by that, consider that part of the windfall for the wealthy is a reimbursement of taxes paid on financial transactions, money that was used to fund Medicare expansion for our poor under Obamacare. That’s right: these plans dig a deeper hole of debt for America because the 1% need more money. I guess I missed that turn when Republicans stopped obsessing over debt. Nice to know that it doesn’t matter any more, so it’s okay to slather more cash on the rich. Enough about the struggling wealthy. We’ll let them pull themselves up by their Gucci bootstraps and instead have a look at how the House and Senate plans will affect you. If you’re poor, you’re screwed. The Congressional Budget Office”s analysis is that under the House plan 23 million more Americans will be cut out of healthcare insurance entirely, which will effectively leave them without primary healthcare; under the Senate version that number drops to an only slightly less cruel 22 million more Americans whose medical needs we’ll ignore. Either way, tens of millions of Americans will have nothing but a last ditch, begging for mercy trip to the emergency room as their primary healthcare. Those trips are always made well after medical attention is needed, so the conditions presented to emergency room staff are far worse and often irreversible. That means people who might have been cured will die. Plus a visit to the emergency room costs more than any other way to deliver healthcare, driving our overall cost much higher. Be clear that every hospital is required to deliver healthcare to whoever shows up at their door, regardless of a patient’s ability to pay. That means that the cost to care for a poor person who drags into the emergency room and receives that expensive care is passed along to all the patients who can pay, like you. That’s how slashing Medicaid will drive up your cost of healthcare. The Kaiser Family Foundation has crafted a nifty way to learn how the various cruel congressional plans stack up against the ACA (Obamacare). Access the comparison with the Senate plan (“BCRA”) here; link to the comparison with the House plan (“AHCA”) here. Just enter your age, income and the state in which you live. Then click on your county, review the results and decide which plan you like best. Be sure to look ahead to what these plans will cost you 10 or 20 years from now. Good chance you’ll be surprised – and not pleasantly so. But that’s just you. Before deciding which plan to support be sure to consider the poor people who will have no place to go but the emergency room for medical care under either congressional plan. Also, don’t forget the rich people who need your financial support. The net of this is that both the Republicans in Congress and the president are so desperate to “get a win” that they are sucking up to the wealthy and abandoning our poor. That is to say, the win means more to them than life or death of our most vulnerable. Reading time – 61 seconds; Viewing time – 2:54 . . .
Bernie Sanders is telling us that he wants Americans to have universal health care – single payer. He is challenged by those on the left, the center and the right, asking how he’s going to get that done. Donald Trump tells us he’s going to deport 11 million undocumented residents now in the U.S. The math for that works out to 7,534 people to be deported every day of a 4-year presidential term. How will he do that? Ted Cruz has a plan to completely re-make the federal tax system. It would reduce the income of the government by $8.6 trillion over a decade. At the same time, he plans to dramatically increase money for the Defense Department and the National Security apparatus. The math simply doesn’t come anywhere near to working, so how will he do that? Marco Rubio disapproves of increasing the national debt limit, but he doesn’t explain how the United States will avoid default on existing debt without raising the limit. By what magic will we not become a deadbeat nation? Hillary Clinton has accepted many millions of dollars from big money influencers, including the fossil fuel industry, big Pharma and big banks. How will she lead without being influenced by those massive campaign contributions and the money sure to arrive for the purpose of funding her second term? Here’s the point: You’ll never get a satisfactory answer to “How?” from any of the candidates. Nobody can tell you how a Democrat as president will get what they want through a Republican Congress. Nobody can tell you how an absolutist Republican president would accomplish his absolutist ends with the filibuster alive and well in the Senate. All you can get is an idea of what these people believe in and the direction they would take the United States if they could take it some place. Decide for yourself if their values and ideas match yours (or if they are totally cuckoo bird) and stop fretting about the “How?” stuff, because most of what is promised during a campaign will never be done. And VOTE. Illinois, Florida, Ohio, Missouri and North Carolina primary elections are on Tuesday, March 15. Show up and VOTE. Here’s some happy news: If you’re an Illinois resident and are not already registered to vote, you can register on election day. Yes, we have same-day registration now, so bring a few forms of ID, like your drivers license, passport, student ID, credit card, utility bill with your name on it – you only need one, but bring more just in case. Show up at your poling place and you’ll be able to register and VOTE right then and there. Reading time – 59 seconds . . . Were you required to do chores around the house when you grew up? Chances are, you were. 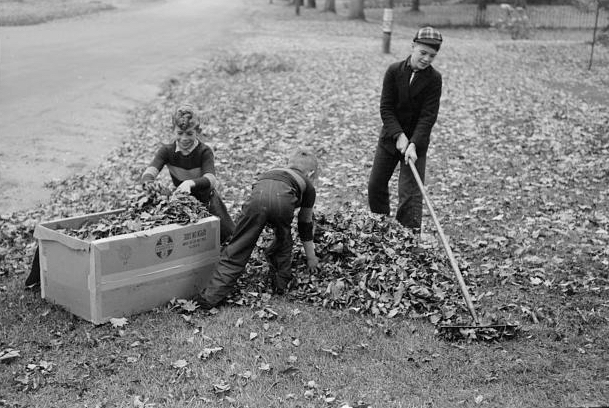 When I was a kid, chores were simply what had to be done and we all had a hand in the work. I recall that once in an moment of teenage male iderntity seeking I balked at doing the dishes after dinner because, I had decided, that was women’s work. My dad listened calmly, then pointed out that there were no girls in the family and my mother was busy with other things and we didn’t have a maid, so get over here and do the damn dishes. That cured me of such nonsense permanently. Note that I learned to be a really good dishwasher. And mower of lawns, shoveler of snow, taker out of the garbage and many other chores. All of that was simply the way things were. Mom had a moment of clarity for me one time when I complained about having to do some chore. She said that was alright. But no chores, you don’t eat. I got the point quickly and it’s a point that has relevance today. Can you think of a group of people who lack a sense of responsibility? Perhaps those same people seem to have no empathy and are completely unresponsive to the needs of others? I can’t help but wonder if a lot of those in Congress got away with not doing chores when they were kids. They certainly aren’t doing their chores now, like passing budgets without self-imposed crises, voting on a new attorney general, overhauling our immigration system, passing sensible gun safety legislation, amending the Constitution to get the big money out of our politics and bringing our education system into the 21st century. And it’s not just the current mix of slugs in Congress. 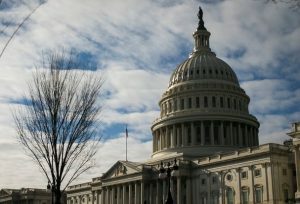 This has gone on for at least the past eleven Congresses, most notably when there was a Democrat in the White House and Republicans flexed obstructionist muscles in Congress. Somebody metaphorically hand those lazy children a rake, a dishcloth or a lawn mower and tell them to get to work. Perhaps they should be given Mom’s instruction, that they won’t be allowed to eat until they do their chores. Reading time – 23 seconds . . .
*The picture above is from a spoof piece making the rounds on the Internet Machine. Thanks go to ES for passing it to me. I have taken liberties with the text for satirical purposes. Note that Congressman Ryan has not yet contacted me to indicate if his mother, Elizabeth Ryan, will be eligible for deportation. 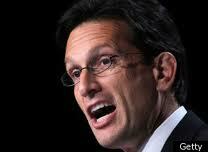 Good-bye, Eric Cantor, latest loser to a new extremist fool. For years you had the power to be the driver of betterment for the American people and you chose instead to be a petty obstructionist. We will not miss your arrogance and lies, your demagoguery and fraudulent misrepresentations, your partisan posturing and your dedication to failure. Your mother may be proud of you, but most of us are not. There are so many programs that the Republicans used to support, like healthcare reform, gun background checks and programs that suggest something science-y, like cap-and-trade. For six years, though, they have been focused solely on opposing anything President Obama supports, so they have turned their backs on their own programs trying to out-testosterone one another and promoting governmental paralysis. Indeed, many Republicans used to be conservatives, but that seems to have fallen into disfavor over on the right, which is now well short of the neocortex. The Republicans are big promoters of a fire breathing, smoke belching military. They support the troops and wave flags and insist that we continue to spend money on defense at the same rate or even more than we spent when we were engaged in a cold war opposing a country that now no longer exists. Let nobody suggest that the R’s are military wimps. They got their camo mojo on and it’s cookin’ all the time, supportin’ the troops. Conservative bedrock in action, right? Except when our troops come home broken up, messed up and throwing up. Then the R’s aren’t so supportive of the troops. That’s when they adjust their bean counter eye shades and sleeve garters to cut budgets. That’s when it’s clear that the “political right” has departed from conservatism. Indeed, Poppy Bush would be aghast to learn that there are no compassionate conservatives. Read Carl Gibson’s excellent article Fake Political Outrage is the Real VA Scandal and see for yourself. These R’s who are refusing to properly care for our wounded are the same right wingers who authorized “supporting out troops” by lying to the American people, trumping up “evidence” for an unnecessary war and then sending our troops into battle without body armor, without vehicle armor and without an exit plan. Then they sent another 100,000 troops to attack Afghanistan, yet another country that did not attack America. Tough beans now for the 1.6 million vets who have cycled home, need help and are applying to the VA for what was promised. Are you looking for conservatives? Don’t bother looking at today’s Republican Party, because there’s nothing conservative to see there. Move along. Ed. note: Thanks to EBC for bringing Gibson’s article to my attention. If It Isn’t a Perfect 10 . . .
Look, it’s as plain as can be that the Affordable Care Act – Obamacare – was flawed from the start. Whatever your political views, the act focuses on payment, not medical care itself. And it doesn’t cover everyone. Besides, the stupid website doesn’t work. Just de-fund it, already. And while I’m thinking of it, our interstate highways are pretty beaten up. De-fund those, too. Education. Now, that’s a mess. Our kids are way behind most of the industrialized world in science and math, so the only sensible thing to do is to just dump the system we’re using. Perhaps funding based on real estate property taxes made sense a long time ago. Maybe, maybe not. But that funding mechanism isn’t preparing kids for today, much less for tomorrow. And we’re not hiring and retaining the best teachers, either, as too many are on the “Three Years and Out” plan. No, this isn’t working well enough to continue to throw money at it, so just pull the plug. The Postal Service doesn’t get any money from the government, unless some bureaucrat wants to mail a letter, so we don’t have to worry about that. But the people running it ought to be re-thinking their whole model. One stamp sends a letter to the remotest places in the U.S. every day. That’s crazy. Maybe congress should increase the requirement for their pension put-away to cover people who won’t be born for another 50 years. That would put the pressure on them to pull the plug. And those spiffs to alternative energy companies – what’s up with that? Those technologies only supply 2% of our energy needs, which is way too little to make a real difference. No point in encouraging that, so we should just de-fund those loony subsidies. What the heck is the government doing in the home mortgage industry? Everyone knows that Reagan was right about government being the problem. We should just let the free market do its magic. The FHA falls well short of doing things right all the time. Adios, FHA. And pay no attention to those too-big-to-fail bank derivatives that nobody understands. Let the free market work there, too, except if those guys crash and burn again and then government will be the safety net. Everything has an exception, right? Medical R & D – now, that’s a real problem. We keep throwing money that way, but where is that cure for cancer? Have you seen it? Neither have I. Now, that’s a really dark hole into which we throw cash all the time, but that’s a system that never delivers like it should. De-fund that bad boy, too. Back to Obamacare for a second. The website is so bad that it’s embarrassing. And President Obama did that, “If you like it you can keep it” thing, which turned out not to be true for everyone. Those are two more good reasons for trashing the entire program. Okay, really just one more, since I mentioned the website earlier. But it’s that bad, though, so it should be beaten up twice. Maybe continuously. There are so many programs that we fund that work at sub-optimal levels. If we are to make good choices about what to do with our scarce resources (i.e. what’s in our collective wallet), then here is the bar that must be cleared: If it isn’t perfect, de-fund it. We all know that the country is center-right. Perhaps it’s there as a result of a pendulum swing from the socially farther left pendulum of the 60’s and the politicians and pundits now like to tell us we’re center-right almost as throw-away line. Or maybe people just keep saying that and have done so for such a long time that we’ve come to believe it, but repetition doesn’t make the claim accurate. Take a look at just a few issues before us. Jobs – About 306 million of we 307 million Americans want the government to take energetic action to ramp up the economy and create jobs. The noise from the far right is the only thing that is making it seem like there is huge opposition to that. As a nation, we are left of center now on jobs. Voting rights – Americans believe overwhelmingly that all of us over the age of 18, with the possible exception of convicted felons, should vote. That’s pretty much smack dab in the center, not center-right. On the other hand, there are Republican strategists who have openly stated that the only people they want to vote are those who will vote Republican. In the 2010 election many states voted far right legislators into office and they have enacted laws they have fraudulently proclaimed are to protect us from a blight of voting fraud. The thing is that voting fraud almost never happens – not even in Chicago. These laws serve solely as an obstacle to voting for young people, the elderly, the poor and those in minorities who tend to vote overwhelmingly Democratic. Let’s see, righty R’s preventing D’s from voting. Hmmm. Immigration – Most of us believe that if people do something wrong that they should bear the consequences. And most of us believe that children of illegal immigrants, born in this country and who have broken no laws should not bear those consequences. Righties don’t want to pass the Dream Act and they are completely out of step with the majority of Americans. The R’s continue to oppose it because they’re afraid they’ll get “primaried” in the next election by a fanatic on the lunatic right fringe. That keeps them disconnected from everyone but the aforementioned lunatic right fringe. This issue is complex, but as a nation we’re pretty much in the center. Taxes on the wealthy – Depending on the week and the poll, anywhere between 62 – 80% of Americans favor increased taxes on the rich. Only the righties who signed Grover Norquist’s pledge to never raise taxes, along with some already wealthy people are opposed to that. That is to say, the country is center-left on this issue. Contraception – Do you really need an explanation about this? Even 98% of Catholic women have used some form of birth control and only some fundamentalist righties have a problem with it. It’s just that a few of them have very loud voices. We Americans are far left in favor of contraception. Women’s choice – The majority of Americans continue to be pro-choice, although by a smaller margin now than in past decades. In part that’s because of the loss of institutional memory of how things used to be before Roe v. Wade. It wasn’t pretty. We are center-left on this. Social Security & Medicare – These are the two most popular programs ever created by the federal government and America is far left on them. Only the righties want to abolish or privatize them. Note to budget hawk absolutist righties: We made a contract with the American people, who pre-paid for these services and we must keep our word. I know you’ll understand that. Education – The righties want to abolish the Department of Education at both the federal and state levels. They are starving schools of funds, so teachers, administrators and janitors are being laid off. School maintenance and improvement projects are being halted and the disparity between the education of our poor children and the rich kids who get to go to elite schools continues to widen. Our children are suffering, their future becomes bleaker every day we fail them and we are putting the future of America in peril. Americans don’t like this. They want their children to be educated and think public education is a very good thing. The righties are completely out of sync with America on this. This country is way left on education. Healthcare – Most Americans want the government to do more to fix it. All that is standing in the way is the resistance borne of the hundreds of billions of dollars being collected every year by the medical insurance companies, big pharma, big hospitals and a few others. We’ve tried letting the market fix this. That has resulted in our having the most expensive healthcare in the world, while at the same time we’re getting just middling results. Only the far righties with megaphones attached to their faces think that continuing to let the free market work is the solution. We want affordable healthcare and are at least center-left on this issue. The list can go on until sunrise. Those saying that we are a center-right nation have either bought into the Big Lie or think they will benefit by making you believe it. 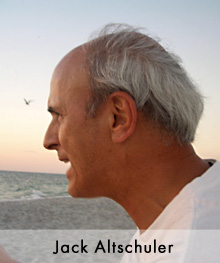 It turns out that the common wisdom isn’t so common, nor is it so very wise after all. Have you seen the TV commercials with the pleasant looking blonde lady in a black pants suit talking about American energy? She tells us how plentiful it is and all we have to do is go get it. As an example, she walks across a map of the lower 48 and tells us about, ” . . . tapping Canadian oil sands for U.S. consumers.” Sounds great. Except the plan for the Canadian oil sands crude is to transport that heaviest, dirtiest crude oil with the greatest global warming footprint via the XL Pipeline to our gulf coast for exporting to other nations. I need for them to explain once again how that stuff is for U.S. consumers because I’m not seeing how exporting it makes it for us. One last comment: That ad and the others like it are sponsored by the American Petroleum Industry, the promotional organization of Big Oil. Just so you know.